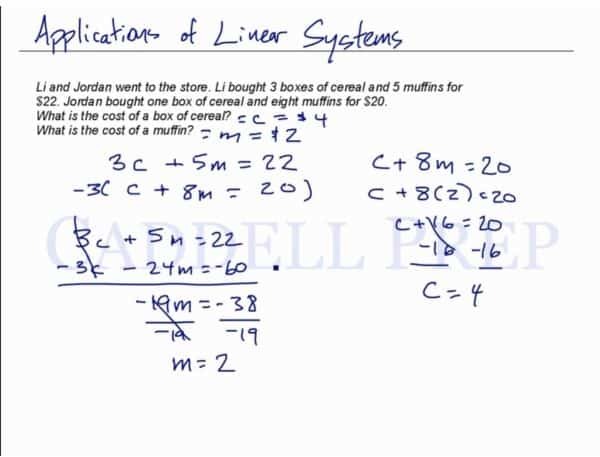 This video shows how linear systems can be applied to word problems. When you encounter a word problem, it is important to write down all the important information given to you. You would then use that information to write out the equations needed to solve the problem. In this case, its substitution by elimination, where you solve for one variable by eliminating the other variable, and then plugging your answer back into an original equation to find the other variable. Be sure to write in the units used by the word problems. Li and Jordan went to the store. Li bought 3 boxes of cereal and 5 muffins for $22. Jordan bought one box of cereal and eight muffins for $20. What is the cost of a box of cereal? What is the cost of a muffin? Let’s go over application of linear systems. At this point, we’ll solve the problem using substitution, equation or graphing. Li and Jordan went to the store. Li bought boxes of cereal and boxes of muffins for . Jordan bought one box of cereal and eight muffins for . What is the cost of the muffin? First, let’s define our variables. Let’s equate what Li bought. Now we have our system equations. Let’s solve this by elimination first. Let’s multiply the second equation by so we can cancel the cost of cereal. Solve for by dividing both sides by . So the cost of muffin is . Let’s substitute this value to find the value of cereal. Let’s use the second equation to do this. So the cost of cereal is .